I’m still wrapping my head around the fact that Thanksgiving is a week from tomorrow. It seems like once Halloween passes, everything else moves at hyper speed til the New Year. Don’t blink! 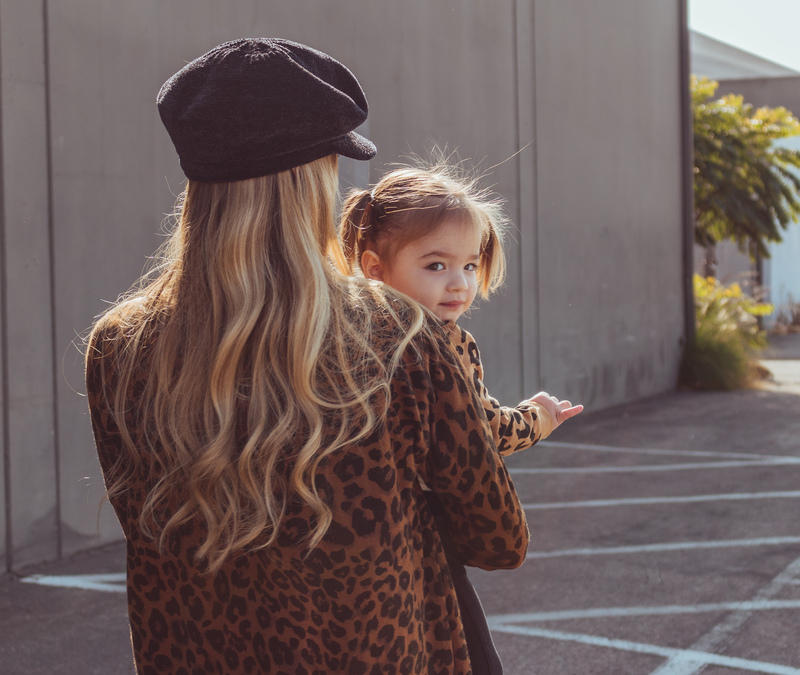 I put these leopard mother daughter outfits together in mind for more Thanksgiving outfit inspiration. If you live some place cooler, you could wear tights or over-the-knee boots instead of booties with my outfit to keep warm. I’ve worn this leopard cardigan before (seen here with shorts), but I really love how it’s something that can work all year round. 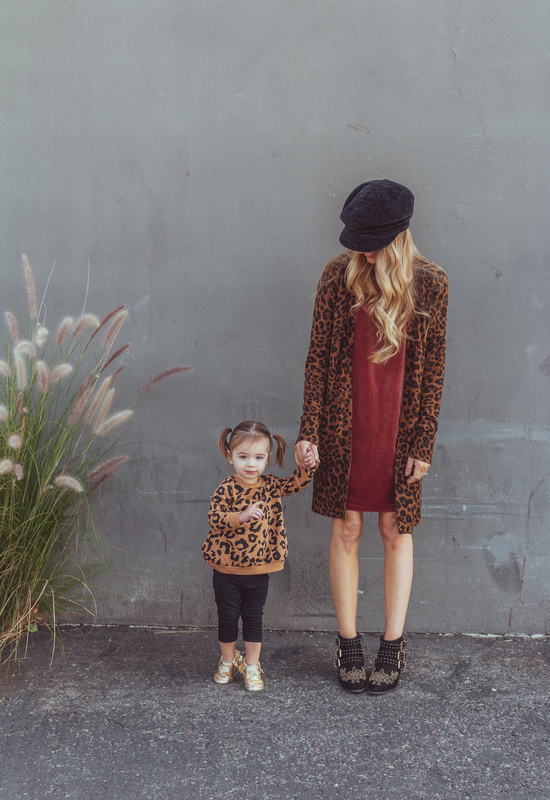 Leopard is such a great neutral, it can really be worn with so many different colors. I paired it with this velvet shift dress that’s not maternity and only $13… it also comes in black. I’ve loved seeing newsboy hats on other people and finally decided to buy one. I got this one for $30 and at first I couldn’t figure out how to wear it. It was poufed up over the brim and sat really high. Jeff said I looked like Dee from Clueless. I finally figured out I had to just squish it down. Now I love it! This one is chenille, which is perfect for fall and winter. Crosby’s sweatshirt says it’s a dress online… but she’s wearing her normal size and it’s way too short to be a dress, in my opinion. It’s mostly sold out now, but I found this top that’s really cute and similar and half the price. I’m also loving this leopard print onesie for newborns up to 4 year olds. Hope your week is going well – thanks for reading and following!